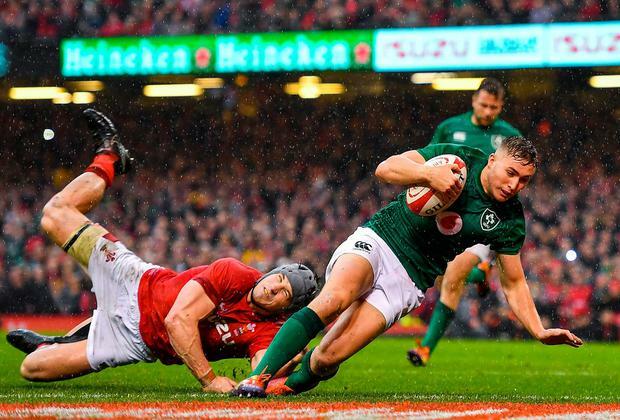 Funny thing, when Jordan Larmour scored Ireland's lone try in the downpour of Cardiff yesterday he bounced up to his feet, and for a millisecond seemed about to celebrate. That reminded you he's a young fella in the early stages of what will hopefully be a long and well decorated career, and it told you also of the effort involved in getting to the final whistle with something - some little morsel - to show for their efforts. Hard earned? Never before have Ireland had to slog so hard for so little in a game where it counted for nothing. This game was closing in fast on the record losing margin to Wales of 29 points, in 1907, skipping neatly over the last time Ireland took a nil return from this fixture, in 1961. And yet last week if you had been making the trip over here it would been in the hope that Ireland could derail Wales from their Grand Slam spin. Soon after the final whistle Joe Schmidt pointed out the small margins, even in a game of that nature, when it would have made more sense to stick to talking about how Wales looked as happy as ducks in a monsoon. And that it had been Ireland's call to open the heavens. As for the thorny issue of whether or not Ireland's World Cup needed to come maybe in autumn 2018 instead of 12 months later, he gave us a line you never thought a man of his achievements would be uttering. "I'd just say to people, don't give up on us yet." 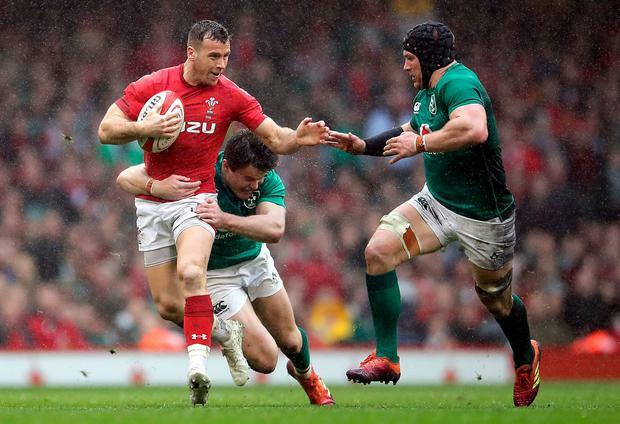 It will take a while to digest and analyse this Six Nations campaign and it remains to be seen if the prognosis calls for a change of diet or to go straight for surgery. It rains a lot in Ireland but it looked like this side had just been exposed to utterly alien conditions. You wouldn't say the harder they tried the worse they got, but certainly there was a huge disconnect between effort and reward. If your set-piece, on a day like this, is not a stick with which to beat your opponents then you run the risk of it becoming a crutch. Ireland struggled there, and then struggled again at half-back, and of course struggled everywhere else as well. They started the first half badly, the second half badly, and got very little right in between. As for Wales, they had the best forward on the field in Alun Wyn Jones, a remarkable leader, and the most combative in Ross Moriarty. Gareth Anscombe kicked seven from seven in challenging circumstances, and impressed in other facets of the game, and was the man of the match. As starts go this one was dreamt up in the Welsh team HQ in the Vale, and when they woke up agreed it was never going to happen. Except it did. With 1:09 on the clock they had got over for a try by the posts, the conversion for which Anscombe gratefully banged over. Not just a great start for the team but on such a slithery surface the perfect intro for the goal-kicker. He had kicked deep to start the game, which saw Jacob Stockdale bundled into touch on reception. The lineout went to Jones at the tail, they got around the corner a couple of times easily enough whereupon Anscombe, off the side of his boot, popped the ball up behind the green defence where Hadleigh Parkes connected with it and scored. How good was that? In the context of such a crap day it was very good indeed. Immediately Ireland were under pressure and needed all sorts of things to go right. Like a set piece that would kickstart their lineout maul. Or a scrum that might squeeze a few penalties out of referee Angus Gardner - something to take the crowd out of the game. Instead the home fans were all over this like a rash. By half-time their team would have all the metrics nicely squared away: a penalty count 8-5 in their favour, with two of them coming from scrums; and on an awful day for throwing and lifting their lineout was better than Ireland's. One of those Ireland misfires is worth revisiting. Late in the half, directly in front of us on halfway, Rory Best had to throw the ball fully a metre towards his own posts to try and connect with his pack. Either the gap had disappeared or the green shirts never stepped up to the mark in the first place. So why not step back and start again? This wasn't the behaviour of team who had done for the All Blacks just five months ago. It was a group who are in a bit of a tailspin. Looking for some light at the end of the tunnel as the second half got underway, Ireland had the following little hat trick: James Ryan was choke tackled; a set-piece move went south when they had got a scrum a minute later; and in the scramble to get back on track Johnny Sexton kicked it out on the full, under pressure. Everything was under pressure. Perversely it stayed that way even when Ireland were in possession close to the Wales line, hammering away, desperate to avoid the big fat zero after their name on the scoreboard. By the time that point arrived the game had long gone and the crowd were running through their repertoire. They paused for a few beats when Larmour eventually got over, but otherwise were in full voice. And why not? Anscombe started pinging kicks over from all distances, adding three penalties in the first 40 to his conversion of Parkes's try. 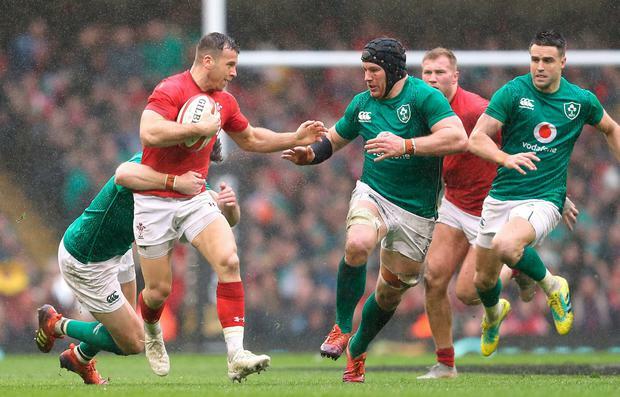 And after the break he picked up where he had left off, after nine minutes punishing Cian Healy for smashing Tomas Francis out of the way as another Sean O'Brien carry had stalled. Sexton kicked the restart dead and the crowd gave it even more holly. The next notable involvement for the Ireland out-half was a breakdown in communication with Rob Kearney where Sexton thought the full-back was staying wide - where the pass went - only to discover he's come short on a switch line. Dismal body language. 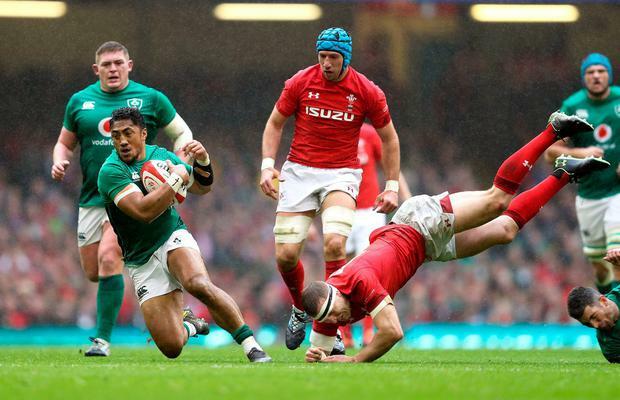 That it happened in the Wales 22 where Ireland had visited only on a strict time limit only made it worse. So Mr Gardner kept picking up Ireland for all sorts and Anscombe kept kicking the ball over the bar. The penalty count of 11-11 is misleading. Wales conceded a clatter of theirs when the destination of the Grand Slam had long been decided. The turnovers-conceded count of 20-8 in favour of the home team is a good indicator, however. They destroyed Ireland on the ground. Next up the World Cup. A bit of introspection to be done before that one.